If you are planning to preserve food for a longer time, cooking the food with a pressure canner is one of the best ways to do it. Pressure canning gives you a way to preserve food by eliminating the risk of spoilage caused by bacteria and its toxin-producing spores. While there are many pressure canner brands in the market and choosing one can be confusing. So, in this post, we’ll also be going to go through which are the best pressure canner brands you should buy. How do Pressure Canners Work? A pressure canner helps you put a great variety of food in food storage. Well, after you know how easy it is to make homemade meals from scratch from home pressure canned food, you may become a pressure canner addict like I am. I get often asked this question a lot, “what is the best pressure canner on the market?” Well, before we look at some of the best pressure canners in the market, let’s go through some of the tips on how to choose a pressure canner and how a pressure canner work. Understanding how this kitchen equipment work can really help you do wonder with your cooking. Working of pressu﻿re canners is easy. Nowadays pressure canners are made up of aluminum or stainless steel and have screw-down knobs that clan the kettle lid. The lid is fitted with a weighed vent port for the steam to escape through the safety valves. The pressure canner may indicate the pressure through a weighted gauge or visual display readout. Similar to a water bath unit, the pressure canner has a removable rack for lifting and loading the jars. However, they are not required to be immersed completely in water during canning. Water needed to generate the necessary pressure vary depending on a number of factors such as the load and size. However, it comes with an owner’s manual that gives the specifications of the amount of water required according to each model. By loading the jars, the water is brought to boil, and internal pressure is built up. The steam pushes out the air through vents, and the vents are closed. The pressure canner is heated till the water boils and the steam is released. Once the steam begins to vent out, the port is closed with a weight and pressurization begin. During this time when the steam can no longer escape, the water boils at 212 degrees Fahrenheit (100 Degree Celsius) temperature. Inside the canner, the jars share the space with boiling water and steam. The heat begins to penetrate the jars, raising the temperature of the steam. After the content of the jar is pressurized, it is ready to be processed. At the end of the process, the heat source is removed, and the boiling slowly stops. After the unit gets cool and the pressure gauge reached zero, open the vent and carefully remove the jars. Allow them to cool overnight. In case you are interested, check out the Granite Ware pressure canner use in the introduction video, below. Holds 7 one-quart jars, 8 one-pint jars or 24 half-pint jars. Available in 20 and 12-Quart capacity. Adjustable 3-piece pressure regulator system. Stay-cool handles and a locking stainless steel lid. Comes with folding handles for easy raising and lowering. Additional safety valve incase main one fails. The pressure regulator is calibrated for three different pressure levels at 5 psi, 10 psi and 15 psi, which is ideal for canning at different altitudes. While picking up a pressure canner, you should be clear about the size you want. Pressure canners come in different sizes, so make sure you pick one up depending on your requirements. 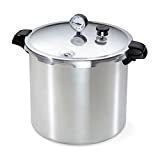 If you have a small family, then choose a smaller pressure canner but if you have a are planning to can a large number of bottles of food at once, get a larger capacity pressure canner like the All-American 41.5qt pressure canner. While considering a pressure canner, make sure you choose one that suits your stove top. You cannot use a heavier pressure canner on a glass stove top. If you are using a glass stove top, make sure you pick one up that is suitable to use for glass tops. You can also choose an electric pressure canner, but remember that they don’t work on high temperature setting. The cost of the pressure canner also plays an important role in deciding upon which pressure canner to choose. If you are getting into canning, but don’t have extra funds at hand, you can pick up an economically priced pressure canner, but the quality might be sub-par. However, go in with a high-end pressure canner, if you have money to spare. A costlier pressure canner is made with better quality and safer to use too. Go for the established pressure canner brands. "Pressure cookers or pressure saucepans are used to rapidly cook meats, vegetables and other foods for a family meal. But they may not maintain adequate pressure, and they heat and cool too quickly to use them to safely pressure can foods. ​Pressure canners have either dial or weighted gauges. Pressure canners are necessary to safely can foods such as meats and vegetables that are low in acid." A pressure cooker, as well as pressure canner, is used for pressure cooking, but the latter comes with an additional function. 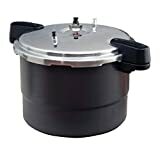 A pressure cooker is used to cook food under pressure in a fraction of the time while pressure canner is designed to be used for home canning of foods. If you want to cook food in short time, you must use a pressure cooker but if you wish to preserve food, make sure you use a pressure canner. Using a pressure canner is not dangerous; however, you can follow these directions to avoid any accidents. Never get your face, arm or any other exposed body part near the steam vent because the intensity of heat coming out from the vent can give you some nasty burns. Before opening the lid, make sure the pressure inside the canner is equal to the pressure outside it. Check the user’s manual for detail instruction. Be careful while lifting the big canner as it is full of hot liquid which can spill during movement. So, be extra careful while working with pressure canners. The All-American 921 Pressure Canner is an excellent addition to your kitchen equipment. It can hold several jars at once and is made from hand-cast aluminum. The dial gauge is geared for consistent accuracy, and the pressure regulator is low maintenance. It has been designed to deliver the pressure and temperature needed for canning. The All-American makes cooking a large quantity of food simpler and easier. Build to last. Can easily last more than one generation. The weighted pressure gauge makes it easy to use and understand. It comes with easy-to-understand user instructions. Constructed out of robust material. Multiple sizes available. From 10.5-Quart to 41.5-Quart. Not suitable for glass cook tops. Kinda expensive compared to other models. A well-known name in the world of canning, Presto, has come up with an amazing pressure canner that makes your canning work a breeze one. Weighing at just 12 pounds, the Presto pressure canner is light enough to be used on electric coils, glass cooktops or gas stoves. Constructed out of wrap-resistance heavy gauge aluminum. High-quality pressure canner at a reasonable price. Can be used on glass cooktop or traditional stove. Build to last and good quality material. Rubber gasket needs replacement after some time. Some previous buyers commented that the after sales service is not great. We are unable to verify the comment, though. As compared to the traditional cooking time, the Fagor Duo pressure canner can save you more than 70 percent of the cooking time. It features a triple-safety system that prevents opening of pressure canner before the pressure is released. It can hold up to four quart jars at one go. While the Fagor does not receive as many satisfaction rating like the other 2 pressure canners above but Fagor does make good quality kitchen appliances. Fagor is a well-known kitchen appliances brand and should be a good choice when you are considering buying kitchen appliances. Less heavy as compared to its competitors. Excellent for canning small batches of food. The handle can take up larger counter space. The ideal pressure canner strikes a perfect balance between safety, capacity, and performance. All of the above featured pressure canners are capable of performing well and have great reviews, but one model that stands out for its superior attention to detail is the All-American 921 Pressure Canner. With its strong built and no-nonsense, quality design, it helps you achieve professional results. If you have some plans for canning soon, the All-American pressure canner can be the best choice to get the job done with ease. No double, the All American pressure canner is the best pressure canner in the market so far.